"When the Lord is pleased with the morality of a people, He gives them a sovereign wise and just." — Saadi. HE above verse of the immortal poet Saadi, the Shakespeare of Persia, pregnant with a deep philosophical meaning, often quoted by the Mohammedan nations, can nowhere be more appropriately applied than in the case of the British people and their august and well-beloved Sovereign. Indeed, it is a matter of high pride and great gratification to the children of this country and the countless citizens of this ever-growing glorious Empire, that her ancient throne is occupied by a ruler as wise and beneficent as she is just and merciful. 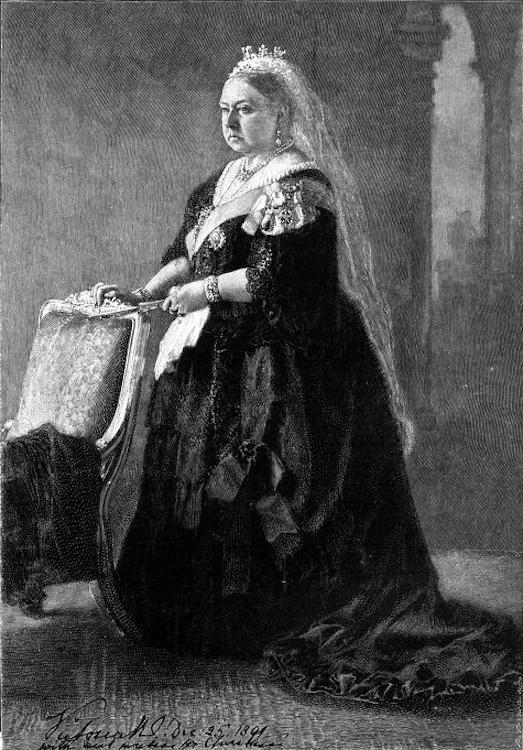 Queen Victoria is admired and adored by [551/52] millions besides her own subjects — not so much because she is the Sovereign of Great Britain (though that in itself is a unique distinction), but because she unites in herself political, moral, and intellectual qualities of the highest order, granted by Providence only to the chosen few. That the Republic of the United States, which is no lover of crowned heads, and which is supposed to worship no other altar than that of genius, should hold in the highest possible veneration the name of our Queen is, in my opinion, the greatest testimony to her sterling merits. Of the political talent of the Queen, it may only be said that she is the greatest authority living on the practical politics of Europe, and particularly on the intricate Constitutional questions of this country. She has spoken politics, acted politics, and lived politics all her life. The ablest of her Prime Ministers often owed the solution of many grave political difficulties to the knowledge of the Queen. A Radical journalist of renown has the following: "Broadly speaking, it may be fairly said by all her Ministers, Liberal or Conservative, that she has more knowledge of the business of governing nations than any of her Prime Ministers; more experience of the mysteries and intricacies of foreign affairs than any of her Foreign Secretaries; as loyal and willing a subservience to the declared will of the nation as any democrat in Parliament; and as keen and passionate an Imperial patriotism as ever beat in any human breast." The administrative ability of the Queen was formally acknowledged by the Society of Arts, the most impartial and learned association in the kingdom, when they conferred the "Albert Medal" on his noble consort, in 1887, for fifty years' wise and most Constitutional administration. That Her Majesty is one of the greatest and most practical moral leaders of England will scarcely be denied by any wise and thoughtful body of men. The Court of England has never been purer throughout its history. Mr. Depew, in his Columbian oration in Chicago, styled her "the wisest of Sovereigns and best of women." John Bright said: "She is the most perfectly truthful person I ever met." A model wife, a model mother, a pattern to womankind! But the quality which would endear her most to posterity is her intellectual eminence. A mind so deep, a will so strong, an imagination so rich could not have failed to give the world a philosophical work of lasting fame or a sensational novel of a high reputation. Even now her wide and fruitful excursions over the domains of literature and science are such as to reflect the highest credit on her mental powers. All who have read her "Journals in the Highlands" and her letters given to the public in the Life of the Prince Consort cannot fail to find a strong literary tendency in the Imperial mind. Nothing surprises one more than her wide information, her sweet and modest expression, and her logical and learned remarks in the course of conversation. But the latest display of her mental activity, which eclipses all past achievements in her literary pursuits, will come as an agreeable surprise upon all lovers of learning in every part of the world. 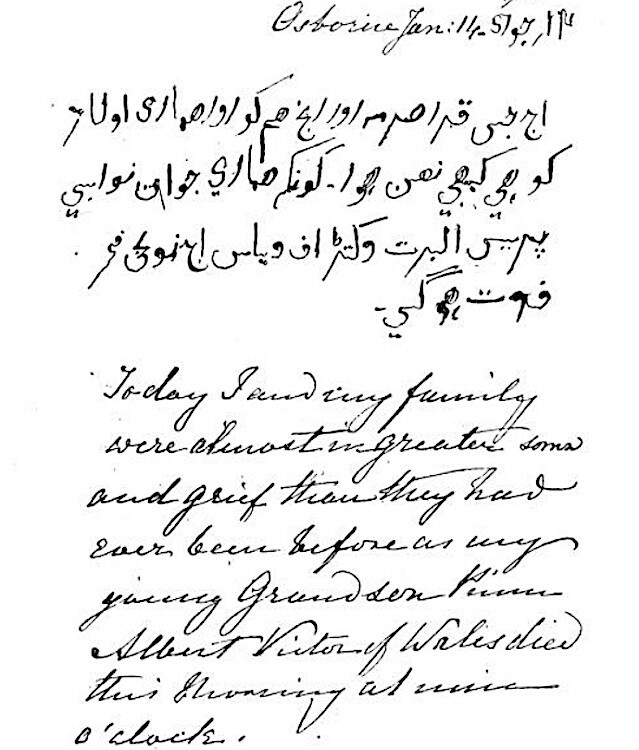 Her Majesty the Queen, with all the duties and responsibilities incident to the possession of the Imperial sceptre, finds time to learn an Oriental language, and has actually made so great a progress during the last three years as to be able to write a separate diary in the Hindustani language. The preservation of all mental faculties by distinguished men of letters in an advanced old age is the peculiar characteristic of the Victorian Era. Among many others, four personages in the Queen's reign have preserved their mental abilities without any perceptible decay to a patriarchal age. These are the late Lord Tennyson, the late Cardinal Manning, the present Prime Minister, and, last but not least, Her Majesty herself. If it is interesting to hear that Mr. Gladstone can deliver lectures, write articles and review novels at his age, it is much more so to know that his Sovereign Lady, at her age, can master a new language entirely alien to the people of Europe, acquaint herself with the philosophy of the East, read the sentiments of her Eastern subjects in their vernacular, and keep a daily account of her work in her new language. It is all the more interesting because the Queen does it with a sincere desire to know the wants, manners and customs, ways and thoughts of the people, and particularly of the women, of India. The fact of the Queen's studies has reacted in the most sympathetic manner in India. The princes and people of that country recognise in this Imperial act a further mark of tender care and parental attention towards her subjects in the East. It serves to add one more strong link to the chain of loyalty and attachment which binds them to the throne of England. The Queen has set a noble example to the princes of India and scholars of the East. The aristocracy in [552-53] India, will return the compliment of their Sovereign by studying her language and literature, and thus bring about mutual amity and understanding between the two nations. The philosophers of the East will be emulated to inquire more and more deeply into the modes of thought and bases of society in the West, and will, as far as practicable, introduce the comforts and conveniences of life afforded by modern sciences into Oriental countries. The Queen's studies have made a marked effect upon the minds of the Mohammedan Emperors. Hindustani is a Mohammedan language, and the Empress of India has the good fortune to reign over a larger number of Moslems than the three Mohammedan Emperors collectively, viz., the Sultan of Turkey, the Shah of Persia, and the Shereef of Morocco. The Sultan of Turkey, ever since his visit to the Queen, has had feelings of veneration for her, and, ever since his accession to the Caliphate, has endeavoured to maintain the existing friendly relations between the two greatest Mohammedan Powers. On my visit to Constantinople, His Majesty, as Protector of Oriental learning, was ex- tremely astonished to hear that the Queen had lately commenced to learn Hindustani, and the news increased his admiration of the English Queen beyond all bounds. The Sultan is a highly intelligent and well-informed monarch, and if the political horizon of Europe continues to be as clear as it is to-day, it is highly probable that His Majesty himself will turn his attention to enriching his Imperial mind with the philosophy of [553/54] India. It may also be hoped that the same news may lead the Committee of Public Instruction in Turkey to establish a chair for Hindustani in Istamboul. 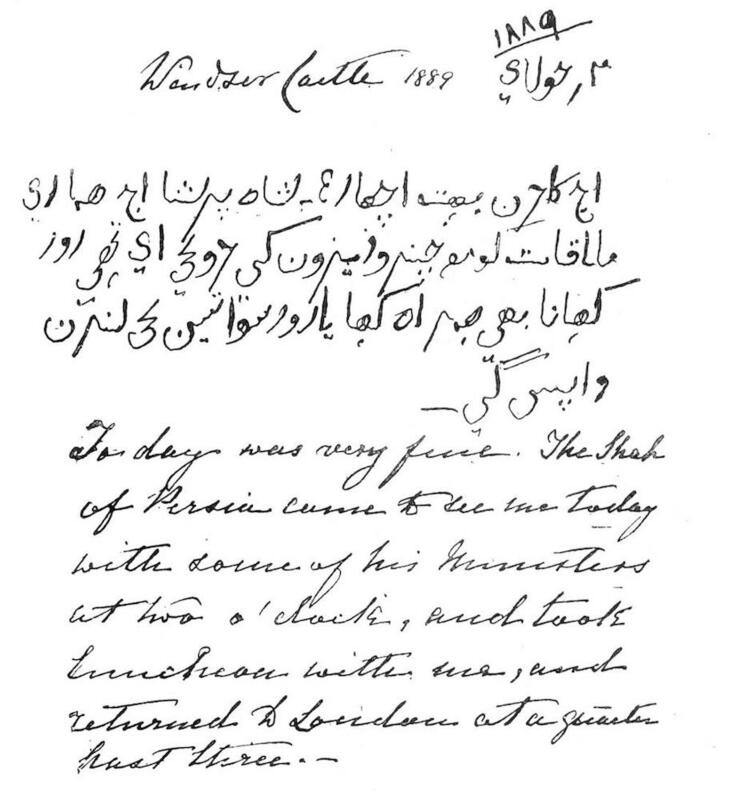 The Shah of Persia, when he visited the Queen in 1889, was no less surprised to see the Queen learn Hindustani than his Imperial cousin at the Golden Horn. The accompanying remarks of the Queen in her Hindustani diary respecting His Majesty's visit will doubtless prove very interesting to the readers of this Magazine. Some description of the Hindustani language will not be out of place here. Of all the modern languages spoken in India — I might say in Asia — the Urdu language stands pre-eminently distinguished for the delicacy and sweetness of its expressions. The Moghul emperors stood in need of a common language for their court and camp, which were composed of representatives of various nationalities, and thus a mixture of Persian, Arabic, and Sanskrit gave rise to a new and beautiful language. Nowhere have the Moghuls rendered a more lasting service to India than in giving her the Urdu language, which may fairly be said to be the lingua Franca of India. It has in it the sweetness of Persian, the grandeur of Sanskrit, and the sublimity of Arabic. The language has, during one hundred years' connection with England, borrowed many political and scientific expressions of the West, and recent translations of eminent foreign works have enriched its vocabulary to an enormous extent. If the language continues to make the present progress in the course of the next hundred years, it will perhaps be the richest language in Asia. Time was when Mohammedan scholars who always used Arabic or Persian thought it infra dig. to use Hindustani as a means of intercommunication, just as much as British scholars thought of using English in place of Latin. But of late the feeling has undergone a complete change simultaneously with the growth of the language. The rich and healthy literature that comes out every day from the pen of the rising generation is simply amazing. Newspapers and periodicals are fast over-running the length and breadth of the country. We have always had beautiful works in poetry and fiction, but modern books on these subjects indicate a marked revolution in the ideas of the writers; while both the manner in which they are written and the matter which they contain are extremely praiseworthy. The rapidity and ease with which the Queen is mastering the language is very remarkable. Among her many enviable qualities, there are two which the Queen possesses in an eminent degree. These are strict regularity and firm determination. Both these qualities have never been more conspicuously displayed by her than in the acquisition of her new language. It is generally known that no frost, no wind, no rain will ever prevent her from her daily drives — I may say, no pressure of work, no anxiety, no sorrow keeps her from her linguistic work. Every day at the appointed hour the Queen is busy with her Hindustani. Even during the hours of most poignant pain and bewildering grief, enough to upset the daily routine of ordinary minds, the Queen did not fail to write her Hindustani diary at the usual time. The accompanying remarks of Her Majesty on the death of the Duke of Clarence in that diary will be read with much interest and sympathy by her loyal subjects. The diary — which I had the privilege of seeing, among many other interesting things at Balmoral — is highly instructive, and I am sure the readers will be very grateful to Her Majesty for graciously permitting us to publish with this article fac-simile copies of a leaf or two out of the same for the benefit of the literary public. I have said above that the Queen's studies have reacted in the most sympathetic manner in the East. The people of India may well expect that they will give new impetus to Oriental learning in this country. For the first time in the history of Europe a Sovereign of a great Power has devoted herself seriously to the literature of the Orient. The fact is noteworthy, because it marks an important epoch in the history of the reunion of the East and West. Whoever writes the future history of the rise and progress of Oriental literature in Europe, will be bound to chronicle the self-sacrificing devotion and gracious literary patronage of the illustrious Empress of India. Forty years ago, when "Albert the Good," with the true insight of a statesman and a philosopher, nobly advocated the spread of Oriental learning in this country, little did he dream that his own Royal Consort would one day declare herself an Oriental student, and thus give a practical shape to his laudable advocacy. Had he been alive to-day we should have found in him, not only the strongest supporter of the languages of the East, but also an Orientalist himself. Doubtless it is that he should have encouraged Oriental learning among the [554/55] members of his own noble and intellectual family. Macaulay says: "The highest intel- lects, like the tops of mountains, are the first to catch and to reflect the dawn. They are bright when the level below is still in darkness. But soon the light, which at first illuminated only the loftiest eminences, descends on the plain and penetrates to the deepest valley." The late Lord Tennyson, it is not generally known, was a great admirer of Oriental literature. He, as a true poet, knew the value of Eastern imagination. His admiration led him to the study of the Persian language, which task, as he regretfully expressed to me, he had to give up because of the weakness of his sight. During my visit to him at Farringford, I was much surprised to find in his library translations of eminent Persian authors. He himself showed me, with much delight, the work of Abul Fazl, a book which he highly valued. His latest poem, the "Dream of Akbar," which he did me the honour of reading aloud, cannot fail to show the amount of the Eastern poetical fluid which [555/56] the poet had imbibed. He was delighted to hear of the Queen's Hindustani studies, and expressed continued admiration of the intellectual power of his Sovereign. Some persons here may call into question the utility of the study of Oriental languages and literature, and declare it to be a mere idle curiosity. But I believe it is of the highest material advantage to all classes in this country. The statesman will be far better able to grapple with Asiatic questions, understand the real wants of the people directly through them, and escape falling into fatal administrative blunders. A poet will grow richer and loftier in his imagination, the East being the affectionate mother and tender nurse of the poetical child. Some of the minor poets of Mr. Trail's list might drink deep at the running fountains of the immortal poets of the East, and convey their sublimer ideas to their brethren of the West. As it is, the poets here do not at all avail themselves of half the accumulated poetical treasure of mankind. What prospects for a master of fiction! The East is a celebrated storehouse for the perpetual loan of beautiful scenes and plots. One romance in the Hindustani language consists of seventeen thick octavo volumes, and is appropriately named "The Garden of Imagination." It is, perhaps, the most powerful work of imagination extant in the world. The novelist might describe scenes and introduce plots that would startle the simple people of the West, and make them thirst after the literature of the East. Byron owes much of his inspiration to his personal acquaintance with Oriental nations. The best of his essays, "Warren Hastings," Macaulay owed to his knowledge of the East. And for his marked success as a novelist, Thackeray was no little indebted to his earlier connection with India. What a valuable information can a playwright or an actor derive from Eastern literature! The multiplicity of nations, religions, characters, and dresses in the land, of the sun cannot fail to offer him a useful inspiration. Daily illustrations of the evolution of modern civilization and of the gradual advancement of human thought must needs give him valuable food for reflection. 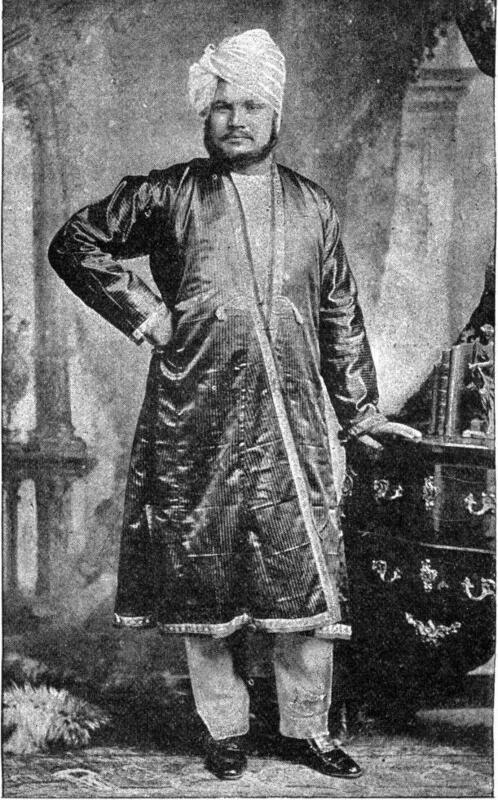 An actor like Mr. Irving or Mr. John Hare may give such a dramatic representation of Eastern scenes as will drown the stage in tears, or keep them laughing for hours. An artist might paint a strange scenery, a new animal, or a fresh plant every day of the year without exhausting his materials. What a vast field will be open to the musicians! I have often wondered how it was that in the concerts and the drawing-rooms here none of the exquisite musical instruments of the East could, by chance, get admission. Is it because we possess no good instruments that can entertain English ears, or because the English artists cannot, owing to ignorance, appreciate them? The excellence of our instruments can be undoubtedly proved, and the fault will, I am afraid, lie at the doors of ignorance and prejudice. We can certainly say that it would be an uncommon treat to the lovers of music if an eminent player like Madame Albani were to give here a performance on the Täoos, Saringe, and Setar. What splendid prospects for the members of the medical profession! The knowledge of a Mohammedan language will place at the disposal of a medical man here the keys of a system of medicine and therapeutics simply unknown to the Europeans. The system contains remedies for certain chronic diseases pronounced incurable by European physicians, which the profession here will do well to borrow. As for religion, it can only be said that not a single patriarch or prophet of note has ever been born in Europe. The East is the blessed land for the birth and work of the chosen children of the Almighty. The language which the Patriarch spoke and wrote, and in which he delivered his orations, and through which he transmitted his Divine message to mankind, cannot but appeal to the highest instincts of his followers, and particularly to those who have taken upon themselves the responsible work of ministering to the soul of man. I was much surprised to hear the Duke of Connaught break the conversation in Hindustani during the course of an interview I had with His Royal Highness a few weeks ago. The words which fell from the lips of the Duke were neither slang nor ungrammatical, but pure Hindustani — unlike those generally used by military officers. The cultivation of Oriental studies among members of the Royal Family of England will certainly render more assistance to the cause of Oriental learning in this country than all the books written, meetings held, and lectures delivered in furtherance of the same object. If knowledge of Hindustani be desirable for English literary people in general, how much more so it is in the case of such of them as live in India. Professor Max Muller tells us in his address which he delivered before the Congress of Orientalists a few months ago, that if the English in India had understood a little better the language and literature of the Indians, the unfortunate mutiny, probably, would not have broken out at all. He also remarks that, if the languages of India be more widely cultivated among the British officers in the East, the social gulf of separation between the rulers and the ruled in India, which unhappily exists to-day, may be bridged over by means of a better mutual understanding. In this respect I may incidentally remark that the high officials in India have wisely commenced to set a noble example to their subordinates. A quarter of a century ago it was by no means an easy task to learn an Oriental language in England. To-day every facility has been thrown at the disposal of a student. The ancient universities have established chairs for important Eastern languages. The Imperial Institute has opened classes for them. There are coaches that prepare students for all examinations. In fact, one can learn these languages with ten times less expense and more conveniences at present than one could do twenty-five years ago. The rapid progress which the Queen has made in her studies is not a little due to the assiduous and responsible services of her able and intelligent Moonshee and Indian secretary. Hafiz Abdul Karim as sprung from a respectable family, and inherits many of its good qualities. His integrity and amiability have won for him the esteem of his friends and acquaintances. In conclusion, we earnestly hope that God Almighty may bless our Sovereign Lady with a long life, sound physical and mental health, and enable her long to control the destinies of the greatest Empire upon earth. Note: This inevitably very flattering article is in the public domain. It was formatted for the Victorian Web and illustrated with the original illustrations, except for the initial decorative letter "T," by Jacqueline Banerjee, who has also added links. You may use the images without prior permission for any scholarly or educational purpose, but it would be nice if you (1) credited the source and (2) linked your document to this URL or cited it in a print document. 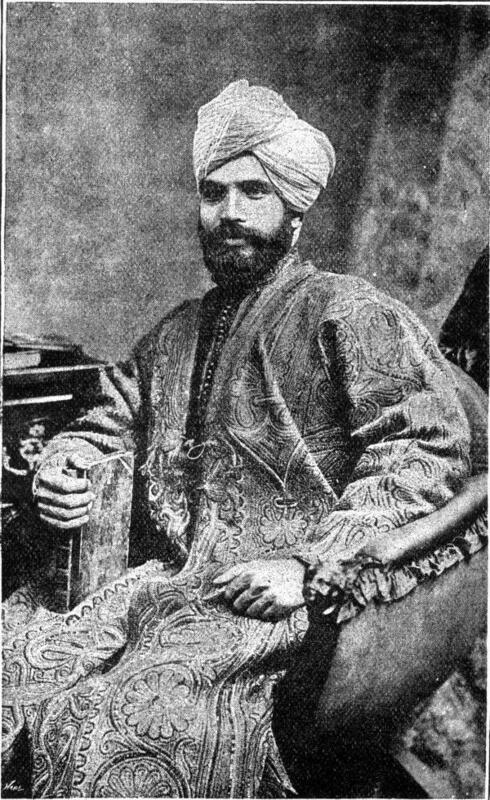 Ahmad, Moulvie Rafiüddin. "The Queen's Hindustani Journal." Strand Magazine, Vol. 24, 12 (December 1892). Internet Archive, with a credit toProject Gutenberg. Web. 3 October 2018.